Vacation in style this year! Hyperion Towers 302 is the perfect choice for small families and couples with distinguished taste. Enjoy the Ocean Drive Difference by starting your vacation immediately upon arrival, as this property comes with fresh bed linens/bath towels, the beds are already made up for you, and the departure maid service are all included in your price. Tile floors and granite counters add a luxurious touch, and the open floor plan ensures you will have a comfortable stay with enough room. Leather furniture in the living room, flat screen wall-mounted TVs, elegant furnishings, and excellent on site amenities make this condo a must-see for your summer vacation or winter residence. 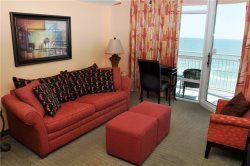 Guests vacationing at Hyperion Towers in the Cherry Grove Beach section of North Myrtle Beach have access to a community swimming pool, sun deck, picnic area with grill, and a wide beach strand. This complex is in close proximity to top North Myrtle Beach attractions, just a short drive away.